Figured it was time to make an account and start connecting with people who know whats up w/ these cars instead of gleaning tidbits of what they answer in threads. Been lurking on this site ever since I got a 1997 318ti black base model about 2 months ago. I originally bought the car to have something I could beat on. I have an e90 325xi daily, owned an e46 ZHP (2004) and an e30 318i (1991). But I really wanted a car I could customize to my liking, and I just really like how the 318ti looks. After buying the 318ti I drove a friends S52 swapped 318ti (Artem, he is obviously a member here as well) and it was INSANE! The most fun I think I have felt in a car in a while. swap an N52 into the ti I just got. - I love how my DD e90 325xi revs and pulls + the associated 6 speed is quite nice. - The expected power/torque of a higher spec N52 setup is on par w/ the stock S52. - It is more efficient, easier to source part/replacement for than an S52 as far as I can tell. - Did I mention, I really like how the N52 + ZF S6-37 combo feels. Well crazy dream shared, hello. And I've seen a few other e30 N52 swap threads. Hopefully I'll cross paths w/ people involved . Last edited by ovosh.m; 10-27-2018 at 05:05 AM. Welcome! As your seen it’s been done but rarely as it’s not the lost cost effective for HP swap. The one done was built by numerous shops, but is possible. Not sure how open Dave and Kassel are about sharing their journey for free. I’m sure you could work something out asking them. As far as s52 parts being harder to find I don’t think that’s true. You can still find just about everything for that motor off any parts website and/or dealer. 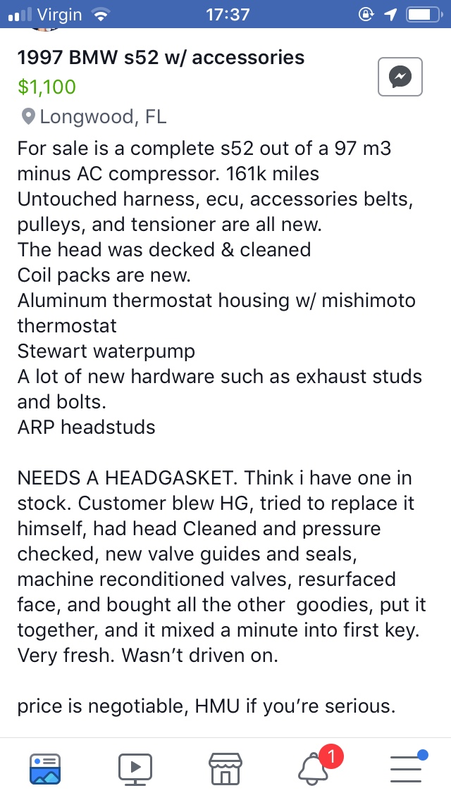 Hell BMW will still sell you new heads. A side swap I should have looked into more but needed my car back was an M54B30. There are very complete DIY for e30 platform with a much lower entry cost than n52 or S52. I know it is not the best HP per $ and maybe not sanest endeavor. Not fully committed to it/any particular swap yet but it is one that appeals to me. M54B30 is intriguing, I'll need to look into that. I really liked the engine in the ZHP I had a while back which I think is a M54B30 w/ slightly different cams. Has a 6spd that can bolt on too . Thanks for the suggestion, exactly the kinds of input/opinions I was looking for. Last edited by ovosh.m; 11-01-2018 at 09:11 PM. An N52 shouldn’t be 2K less than an S52. Either you’re looking at overpriced s52 or dirt cheap/questionable N52. For comparison my full s52 dropout from e36 M3 was 2100 with 130K. I’ll attach a FB post of one. Check more popular forums or even CL. The m54b30 can also be modified for more power with the typical bolt ones, etc. I’ve seen full cars for $1000 with that motor so far less than other options. Basically any e30,e36 trans bolts up. A lot of this comes down to money,skill level and time. Are you going to be doing this yourself? Are you wanting to learn from this? Or will you be dropping this off for a shop to build? I recommend getting as much information from what you want out of it and go from there. Ie, is this something you want to drive soon, etc. an S52 is bolt with some simple wiring modifications. The 2k was from comparing prices I could find w/ google. It seems an N52 can be had for ~700 dollars on average. While the S52 seems to go for much higher . I'll take a look around various forums, but don't have a FB account and don't really want to make one. Is that a good market for car stuff? I don't think I really want/need much more power than a stock M54B30 or N52B30 or S52 would make. maybe a bit more torque, but I really liked how my friends S52 swapped Ti drove. I think I'm set to undertake something like this financially, and have plenty of time as there is no rush to complete it. I'd say I'm probably on par w/ a decent indy mechanic, although i haven't done any complicated engine work. Done pretty much everything else though. I'd like to try and do a lot of this myself. Learning new skills is something Im always trying to do. I went to college for Electrical Engineering so I think I can sort most of the wiring/interfacing. I also have access to a pretty decent machine shop at work, so can probably fabricate things if necessary. That said, I understand there is a lot of experience and knowledge shops can provide that I would be hard-pressed to replace w/ research and perseverance. Figuring out what I want out of this is exactly why I joined. Gotta know whats possible and the pros/cons. Keep your eyes open on car-part.com. Most salvage yards with work with you (and other yards) to have a motor shipped to the nearest yard who can then deliver it to your doorstep. On another note, if you've come this far in life without joining Facebook, I wouldn't bother. You're not missing much. I would be cautious of a $700 N52 and it'll still need the typical BMW items such as gaskets, WP ($250 for N52) etc. Check around for other motors on other forums. FB does have a lot but as Boston said, there is little need to join FB now. If you like the power from the S52 I would look for S52 or M54B30. I would say main issue is that the N52 is not near as "plugnplay" as the S52 is (you can get that done in a few weekends) or even the M54. Ideally you'd need a donor car or at least an N52 with the full harness for this like the already mentioned swap had. The N52 318Ti was built by several BMW specific shops which have have many more resources that you or I would have. Not saying it's impossible but you might find yourself stuck more often than not. Since this isn't a popular swap in any chassis yet there are limited people to assist and guide. But if it's what you want it's what you want. Personally if I had the time when I did mine, I would have gone for an M54B30. For the cost and power they make it would have been cheaper than the S52. Rebuilding one, even if you don't want to tear down the bottom end, is doable. Check out the build threads below. The main issues on the M54 into E36 is modifying the wire harness which it seems like you have the skills to do so. Let us know what you're thinking. Cheers! Just a quick update to the thread, I think I'm leaning towards the M54B30. 2) It uses the MS43 which seems to have been opened up by the community, this is a big plus. Im thinking the most economical way to go about this would be to find a Z3 3.0 donor car, so I'm starting to hunt around for that now. In the interim I've been driving the car around a lot and am loving it even with the M44 . Probably gonna be busy for a while just fixing lots of little things, and upgrading non-drivetrain relating components. From what I understand a Z3 chassis would be the easiest way. There is some decent resale value on Z3 parts as they are not plentiful in the aftermarket world. Yes the computer so to speak has been cracked for a while and there are multiple tuning options. I would recommend overhauling any motor you for a peace of mind but leaving the bottom end together if you'd like. That way you can ensure a leak free future. I'd throw some headers on as well for a slight HP bump and sound. Looks like complete wrecked Z3s can be found. You could even toss in a set of cams for bump/aggressive power band.